It may be a good thing that ants are so small. If they were even half your size, they’d be able to snap you like a twig. They may be tiny creatures, but they are incredibly strong and can handle weights that are many times their own. There’s a good reason why these seemingly innocent pests became the inspiration for a super hero with a blockbuster franchise — it’s just too bad they don’t all look as good as Paul Rudd. About 65 million years ago, a massive event wiped out the dinosaurs and just about all other life on earth. Scientists don’t know exactly what happened during what is known as the K-T event, but they do know that it gave rise to mammals, including people. Ants were around before the event, and not only did they survive, but they actually experienced an explosion in their population. Ants saw more diversity in their species, which ultimately helped them to become the tiny terrors we know today. People aren’t the only colonizers. Ants routinely raid the colonies of other ants to steal their eggs an larvae. Then they either eat the young or they put them to forced labor. Some species of ants cannot survive without this practice. Known as slave-making ants, these ants rely on the stolen ants to support their own colonies. In fact, some of these ants cannot eat without these stolen ants. Ants are strong and crafty enough on their own, but they also work with other species to achieve their goals. More than 200 species of ants help to grow fungi, which can be used for food and other purposes. For a long time, researchers though that ants passed on this fungi to future generations of their own species. However, they have recently discovered that they pass the fungi onto other species of ants. This may not seem like such a big deal, but it actually shows that ants are able to cooperate for the benefit of not just their own survival. They have the means to create an ant empire! When you turn over a rock and find a colony of ants, you could be looking at thousands of ants. Now imagine how many there are around the world. You don’t have to imagine. There are more than 10,000 TRILLION ants — a number that makes our 7 billion look like chump change. Ants can be found on six continents. They are even found on isolated, island countries. The only places that you won’t find ants are Antarctica, the Arctic, and a few remote islands. It’s not a big deal if there are so many ants in the world since they’re so small, right? Actually, they are getting bigger. Historically, the biggest ant discovered was 2.4 inches long and had a wingspan that was almost 6 inches long. Imagine having that flying at your face! Imagine those ants in swarms. It really makes your garden-variety Arizona yard ant seem like small change. BUT if ants continue to grow as they evolve, the future could be really scary. Varsity Termite and Pest Control can’t do anything to make this future less scary, but we CAN ensure thorough ant removal from your Arizona home and yard so that you don’t have to worry about it any time soon. An exterminator will visit your home and get to the source of your ant problem in order to determine the most effective solutions for eliminating these pests. We also have solutions for other common problems for Arizona homeowners, including scorpions and termites. 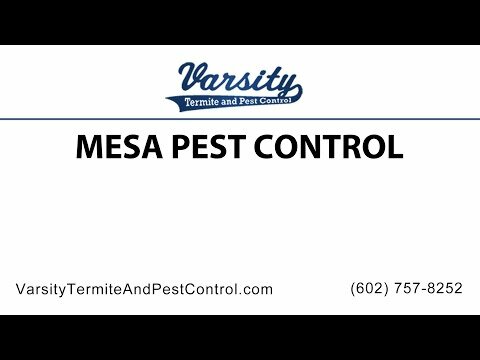 With our Mesa pest control services, you can put yourself at ease and protect your investment in your home at the same time. Call us for an estimate.